Mayor Susana Villaran has battled rats, tax cheats and chaotic streets of Peru's capital. Now gangsters are attempting to bring her down. 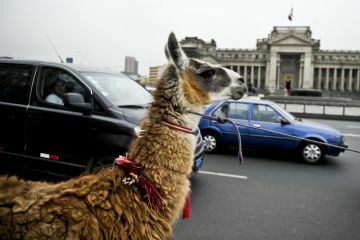 LIMA, Peru -- When Susana Villaran was unexpectedly elected mayor of Lima, few believed she would make headway in the urgent task of modernizing what may be Latin America's most chaotic capital. The moderate leftist former human rights campaigner had no experience of running a major organization. Even supporters worried she was unprepared to take charge of this troubled city of 9 million. Yet now, halfway through her four-year term, just as she appears to be making progress in overhauling Lima's catastrophic public transport system, she faces a recall election linked to a previous mayor accused of corruption. For many, the March 17 vote will decide far more than Villaran's personal fate -- or even whether the capital will ever be rid of the antiquated fleet of rattling, polluting minibuses that undermine the quality of life for all who live here. Nobel-winning author Mario Vargas Llosa has warned that the recall amounts to a "destabilization of our legal system." Columnist Augusto Rodrich, writing in Peruvian paper La Republica, added that launching a recall for no obvious reason, with opaque financing and its instigators refusing to show their faces to the public "has the stench of the mafia." Peru's recall law was approved by congress in 1994 in an attempt to control rampant official corruption. Yet, although many are critical of Villaran, Lima's first female mayor is widely viewed as honest and well-intentioned. The same may not be said of those pushing the recall. Officially, the man who oversaw the gathering of the 400,000 signatures required to trigger the vote is Marco Tulio Gutierrez, a self-described expert in municipal law. But his vision for Lima appears anything but forward-thinking. Recently questioned about the city's fledgling Gay Pride march -- which Villaran supports -- Tulio Gutierrez responded: "I am not homophobic. I am fag-phobic." Yet Tulio Gutierrez, who has been at a loss to justify the recall, has repeatedly refused to reveal who put up the 2 million soles ($770,000) needed to pay an army of canvassers to gather those signatures -- including giving away candies to entice wary voters. Media reports here, however, appear to show that Villaran's predecessor in the mayoral hot-seat, Luis Castaneda, is the man pulling the strings from offstage. Castaneda, who finished fifth in last year's presidential election, was Lima's mayor from 2003 to 2010. A return to public office would give him immunity from prosecution over the alleged payment in 2006 of 36 million Soles ($13.9 million) to Comunicore, a waste-management company run by a friend. The company abruptly stopped operating shortly after the alleged transfer and much of the money was withdrawn from Comunicore's account in cash and is now untraceable. Castaneda, known in Peru as "the mute" because of his dislike of public statements, did not respond to GlobalPost's requests for comment. Nevertheless, after a battering from the country's yellow press, some 70 percent of Lima locals initially were planning to vote to boot out the current mayor. Part of Villaran's problem may be her high-mindedness. She began her term by allowing daylight to finally shine on the city's opaque administration, inadvertently giving her critics ammunition to attack her with. And she has eschewed the normal populist trick in Peru of plastering her name all over every bridge, hospital and park funded by her administration. Yet she does have genuine achievements to her name. The most obvious is the closure of La Parada, Lima's Dickensian principal wholesale food market. Vendors at La Parada largely avoided paying taxes, and poor hygiene meant the market was home to an estimated 2 million rats. Authorities have wanted to relocate the market since the 1960s to a purpose-built building where traders would be forced to register with Peru's tax agency. Yet no one succeeded until last October, when Villaran ordered a police operation to take on gangs of thugs, allegedly hired by the wholesalers for 100 soles ($38) each to riot and prevent the eviction. After three days, more than 100 arrests, four dead rioters, and one injured police horse that had to be put down after being struck by a machete, the operation was successful. Now Villaran is attempting to outdo that achievement by taking on Lima's disastrous public transport system. Rattletrap minivans known as "combis" engage in a constant, cut-throat competition for passengers. They jump red lights, honk horns, abuse customers, and swerve recklessly across multiple lanes to pick up rides. The result is appalling air quality, frequent gridlock and fatalities, even though Lima has few cars for a city of its size -- and nightmare three- or four-hour daily commutes for many who live here. Now, Villaran is attempting to dismantle the corrupt, shadowy concession system for combis. The city transit office awards concessions behind closed doors to holding companies that do not even own vehicles. Instead they sublet to other companies who charge a daily fee to drivers. Concessionaires make as much as 2 million soles a year ($770,000), according to transport think tank Luz Ambar, while incurring nothing more than office costs and driving the quality of public transportation through the floor. "These reforms are absolutely urgent," Mariana Alegre Escorza, of Lima Como Vamos, a local urban planning nonprofit, told GlobalPost. "They have been postponed for decades because they are politically costly. Ultimately, what has been put on the backburner is the quality of life of everyone who lives in this city." Some commentators believe voters will rally to Villaran, concerned by the implications for Peruvian democracy of kicking her out. The most recent polling has seen those in favour of recalling her fall dramatically to 54 percent as the recall campaign has come under increasing scrutiny. But that is still roughly 20 percent more than actually approve of her job performance. "Politics is not a sewer. It shouldn't be that activity that young people hate," Villaran has said. "You steal but you carry out public works. You are cynical and never tell the truth." In March, this unruly South American capital will put that noble aspiration to the vote.